Rocker Build for Baby "E"
I've been thinking about building a rocking chair for a long time, so when Katie told me the great news and I found out that baby "E" was on the way, I decided that it was the perfect time to jump in head first. I went online and ordered Scott Morrison's Montana style rocking chair template kit. I've been sending some of you updates on my build progress via email, but I decided that creating this blog would be an easier way to track my progress and to let those of you who are interested to follow along. I'm going to recap my progress to date in this first post. April 5, 2016 - Is this walnut or gold?!? After MUCH discussion with Katie as to what species of wood to use for the rocker build, we landed on walnut. I swung by Crosscut Hardwoods in Seattle on my way home from work to buy the lumber. 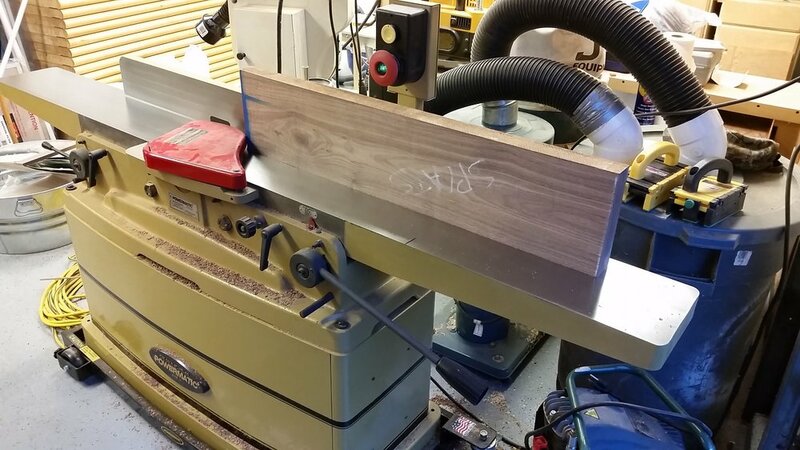 I spent a couple of hours picking through the racks of 8/4" rough sawn walnut, but finally found the boards I needed. It's really nice stuff, but at $12.99 per board foot, it better be. Right? Excuse me sir, what did you say the total was??? April 9, 2016- Templates are a hobbyist woodworkers best friend. Scott Morrison's rocker kit came with full sized paper templates and a step by step DVD with instructions on how to build the chair. Step one was to cut out each paper template and glue them to 1/4" masonite. Then I cut out each piece to create reusable 1/4" templates. I'll use these to transfer the shape of each piece onto the walnut. 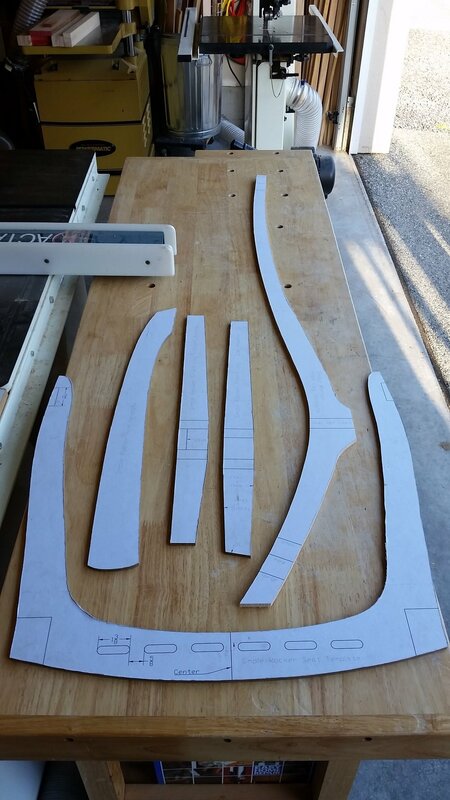 Templates made to date: Seat, arm, rear leg, and front leg. Parts templates all ready to go! April 20, 2016 - Measure 20 times... cut never! I started using the templates to do some layout on the actual pieces of walnut tonight. 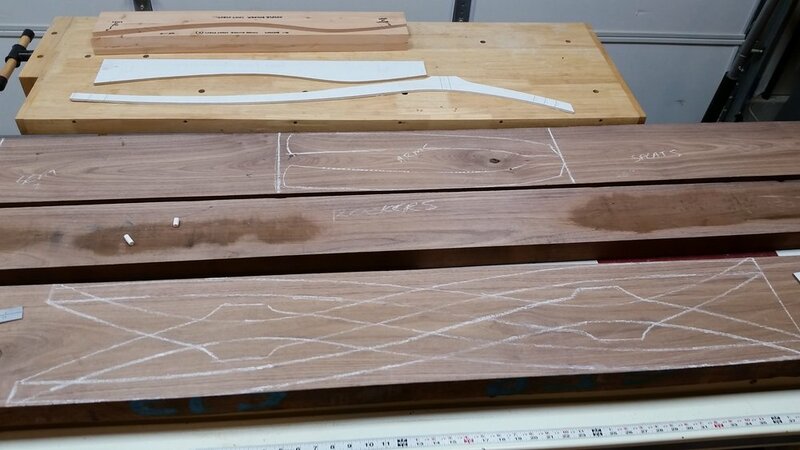 I'm using chalk to trace the templates, which lets me see where best to locate each piece to utilize the best grain for both appearance and strength. I find myself taking the old saying, "measure twice, cut once," to the extreme. It's turning out to be more like, "measure 20 times, cut never!" Better safe than sorry I guess. I think I've got it figured out now. Next step is to chop each board into shorter lengths, then I'll start milling each piece to true and square them. Attached are some pictures of the wood with most of the parts laid out. Lots of work ahead, but I'm getting excited to start making some walnut dust fly! I've also got the form for the splats cut out and ready to go. How many different ways can I do this layout??? "Here's the final layout plan. I got some good shop time in this weekend and got the walnut slabs cut down into rough lengths for each chair part. 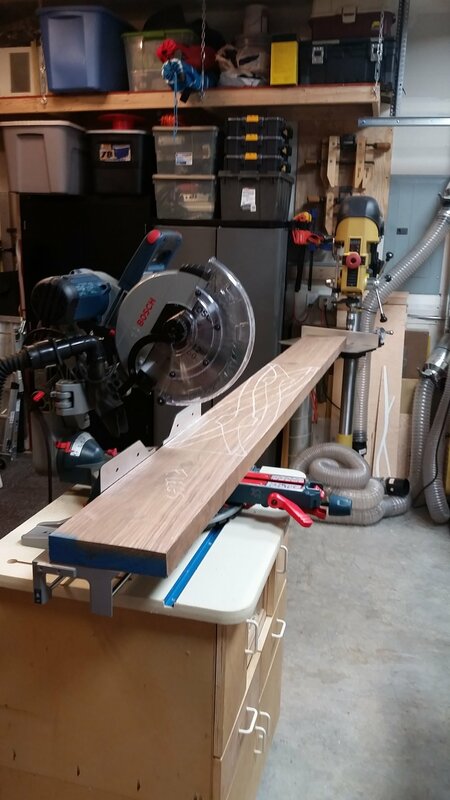 I had to get a little creative and adjusted the drill press table to support the ends of the long pieces while cutting them down to size on the miter saw. Next step will be to square and true each rough piece. Who needs an outfeed roller? Parts all cut to rough length. I also laminated some 2x material together to make the rocker form, which required a 2 step glue-up. I needed the form to end up 2" thick, so I had to laminate 2 layers and then send it through the planner to get it down to 2" thick. Next step was to trace the form template out, then cut out the form shape on the bandsaw. A little sanding on the spindle sander and I got the rocker form finished tonight. Milling rocker form down to 2" thick. Rocker from cut to shape and sanded. May 23, 2016 - The milling begins! "Milling the board that will become the splats on Adam's jointer. Here's a look at the board that will become the runners after it's been flattened. 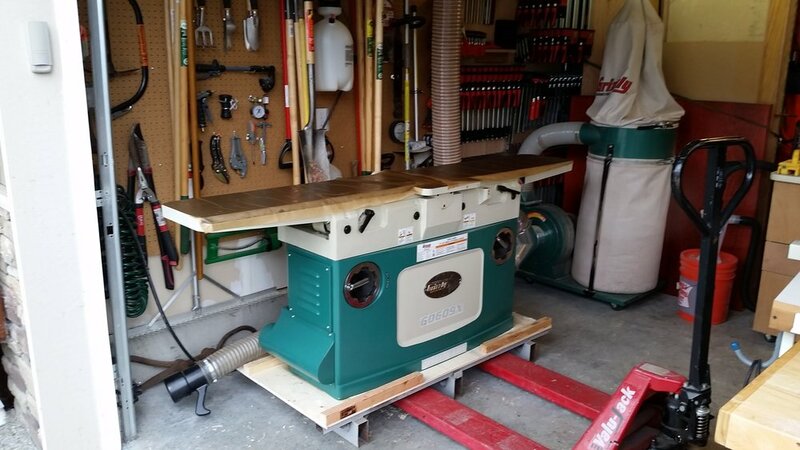 As mentioned in the previous post, my 6" jointer just wasn't up to the task, so an upgrade was needed. I've had my eye on a new Grizzly G0609X 12" jointer with spiral cutter head for a while now, so when it went on sale a few weeks ago, I pulled the trigger. I got the notification that it was ready for pickup yesterday, so I made the trip up to Bellingham this afternoon to pick it up. With a little creativity and help from Adam, we got her into the shop safe and sound. That's what you call a SLIGHT jointer upgrade. May 28, 2016 - Grease covered EVERYTHING! Grizzly makes sure that their products arrive at their new homes free of rust. The only problem is that they do this by shipping their machines with a thick coating of oil & grease each and every part. It took a couple of hours and a full roll of paper towels, but I got it all cleaned off. After that, I spent the better part of the day doing setup and calibration. It took lots of tedious adjustments and checking with a straight edge and feeler gauges, but I finally got her dialed in. I'm super happy with the spiral cutter head; she cuts like a dream! Is it wrong to love a machine? Here's a peak at the spiral cutter head. May 29, 2016 - Slice it thin to win! Well it seems like it's taken forever to get to this point, but I finally started making actual pieces of the chair today. I milled the boards for the runners and the splats down to 1 1/2" thick and sliced them into sequential 1/8" strips. 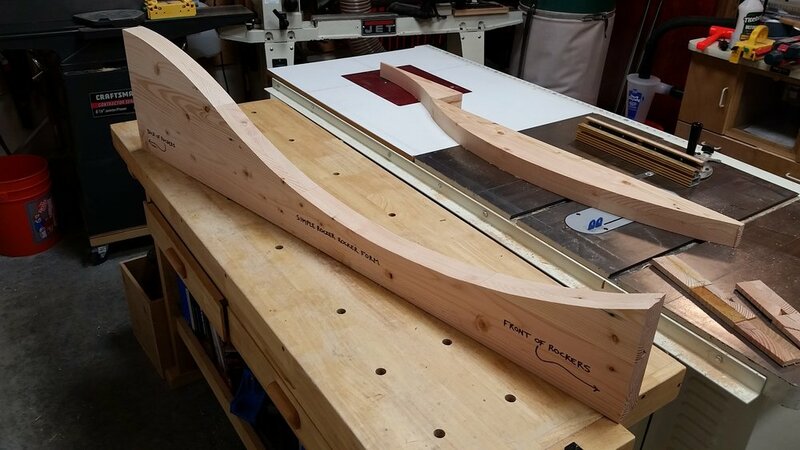 These strips will be glued together and clamped to the forms I made to create the curved runners and curved back splats. The idea is to keep each 1/8" strip in order as I cut them, so the grain and color will look consistent when I glue them back together. I got the first splat glued and clamped in the form tonight. Now I only have 5 more splats and 2 runners to go! 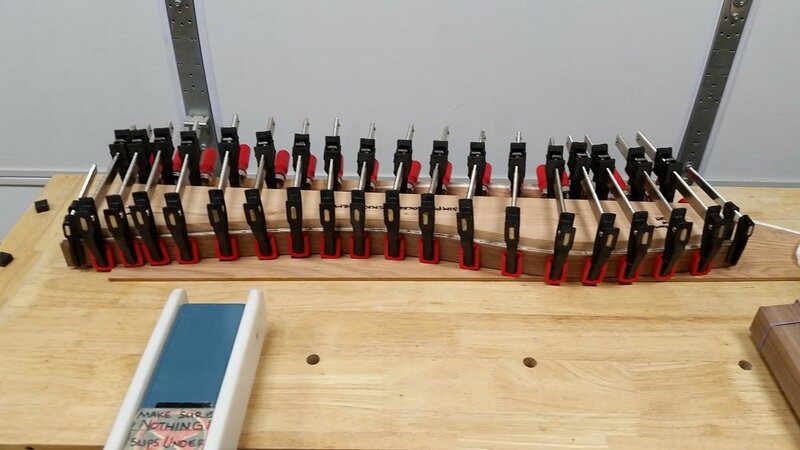 Sequential 1/8" splat strips clamped together to show grain match. Sequential 1/8" strips cut and bundled for the runners (with a few extras on the side). Clamps prepped and ready for first splat glue-up. First splat glue-up all clamped up and drying.